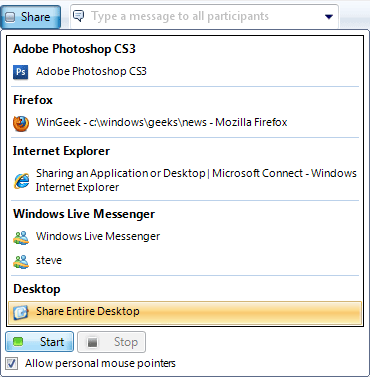 Microsoft SharedView is a free utility that allows you to share your desktop, applications and documents with up to 15 people online at a time. It is perfect to hold a small meeting or to show a family member how to do something. Best of all it works well through firewalls and routers so you don’t have to worry about connection issues. Getting Microsoft SharedView up and running requires a Microsoft Live ID, broadband connection and a short download. Once downloaded and installed just start up the utility from the start menu and sign in. Then click Start a new session and send your participants the link and details provided. Finally,click the Start button to start your meeting/event. After the meeting has started you need to share something for your participants to view. Click the Share button on the top of the screen and select the app you want to share. You can also select your entire desktop on the bottom of the list. Once selected click the Start button to begin sharing.